The RV Toilet of today is getting very similar to a house type one. However, as much as we want to think they are just like them, they really aren't! There are 2 main differences between an RV Toilet and a house type one. 1. The house style toilet will have a large "water reserve" tank attached to the toilet to flush waste away. 2. The house style toilet will also have a "trap" within it's basic design to trap water within it's base to keep sewer fumes out and help rinse away waste residue. 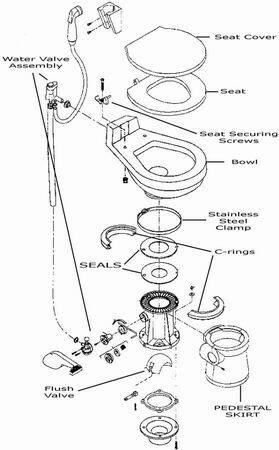 OK - so, just how does an RV Toilet system work? Let's look at a basic picture of one. You'll notice it doesn't have a "water holding tank" above it. It will also have a foot switch (most common). This picture shows the foot switch to the front of it. Many are also to the side. It's hard to get the true perspective here, but the bottom of the visible part of the RV toilet or RV commode is taller than the typical house type. OK - so just how do they get water and flush? First of all, remember, we are on a RV with limited water resources. Since we like to travel and boondock in an RV, a sanitary, yet minimal water usage system, was needed. To start the flushing process in a RV Commode, that foot pedal in front is depressed. That starts 2 different water flows. The first one is the basic rinsing of the toilet bowl - just like the house style. The difference is the water is pumped directly from the RV holding tank - not a "special toilet reservoir" - like a house type one. The second water flow is with a short hose that has a spray valve on the end. This special hose is pressurized only when the foot pedal is pushed down. This allows the person flushing to aim a spray nozzle of water directly wherever it is needed to help flush and clean the toilet. 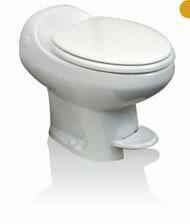 Using the RV Toilet, instead of a house type one allows minimal water usage, while still flushing the toilet. The foot pedal is spring loaded, to keep it in the closed position. When pushing down on it, not only does that turn the water on to rinse the bowl with regular and sprayed water - it opens up a special "gate valve" to allow the exit of the waste and water out of the actual toilet. As soon as you remove your foot from the pedal, the valve closes and seals the toilet. This "gate valve" operated by your foot flows the waste directly into the black storage tank. There is minimal piping/plumbing from the toilet to the black waste tank. Caution - you really don't want to flush the toilet with the roof vent fan on in the bathroom!! Whew... it will stink!! When flushing, the fumes get sucked right out of the tank into the room!!! Since you are opening the toilet to the tank directly, without a "fume trap" - you will pull the fumes into the bathroom area! Let's just say - you'll only do that once!!! As in anything, there are at least 2 major producers of an RV Toilet - Dometic and Thetford (owners of Norcold Refrigerators). Some people claim the plastic bottom isn't as nice as a china bottom. Now, you can replace your plastic for china. Don't really understand why, but - to each his/her own!! It needs a little TLC every now and then - the rubber seal between the waste tank, toilet bowl and the gate valve gets residue/crud in it. I found a cheap dentist type pick works very well - find them at RV Flea Markets! Not a sharp one, but a nice dull one that is bent about 90 degrees, so you can run it between the seals and the bowl. After that, just spray the gate valve itself with silicone every now and then. Just bend one end of the above tool to get into the gaskets. Replacing the seals isn't that difficult - just messy. Couple of hours with readily available kits online. They seem to have their act together! I've ordered various Toilet repair pieces/kits from them. They have a secure order processing system with very good listing of toilet parts with actual pictures of the parts or kits! Have a "wobbly toilet? The reason could be as simple as the 4 securing bolts coming lose - or your plastic floor flange has broken a tab (or two) off. That's the very bottom item on the parts breakdown picture above. Check out our RV Toilet Repair page for a great idea on dealing with a flange that has broken tabs - especially since it is liquid welded in place - and impossible to remove! !